OPINION: Folk medicine has favoured apple cider vinegar for centuries and many claims are made for its supposed benefits. Apple cider vinegar is made by chopping apples, covering them with water and leaving them at room temperature until the natural sugars ferment and form ethanol. Bacteria then convert this alcohol into acetic acid. Strands of a “mother” will form in the cider. These are strained out of many products but left in others, and are often the target of health claims. The “mother” can also be used to start the production of the next batch of cider. But will apple cider vinegar really help you lose weight, fight heart disease, control blood sugar and prevent cancer? And what about claims it is rich in enzymes and nutrients such as potassium? 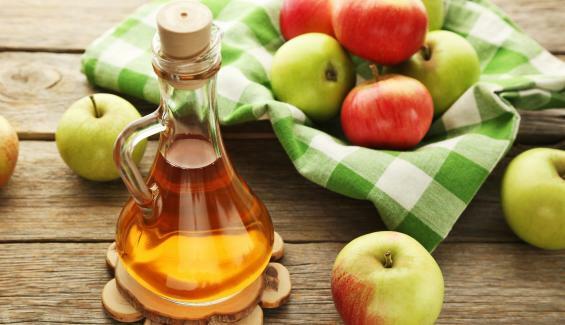 The evidence that apple cider vinegar helps fight fat is weak. A short-term study in Japan added two daily drinks of 15 millilitres of apple cider vinegar mixed with 250ml of water to the usual diet of overweight men and women. Their weight fell by about one kilogram over 12 weeks, but returned to usual levels within four weeks. According to a UK study, it may be that vinegar can suppress appetite. When offered a pleasant-tasting vinegar drink, one that was less palatable, or a non-vinegar drink with their breakfast, volunteers who downed both vinegar drinks felt slightly nauseated. Not surprisingly, this depressed their appetite, with the least palatable vinegar drink having the greatest effect. Others claim taking apple cider vinegar with meals will help digest proteins faster and therefore generate higher levels of growth hormone. This is claimed to break down more fat cells. Unfortunately, there’s no evidence to support such ideas. Claims that pectin – a type of viscous dietary fibre – in cider vinegar will help weight loss by making you feel full for longer ignores the fact that the pectin in apples is not found in apple cider vinegar. Pectin is again credited for cider vinegar’s supposed benefits for heart disease, with claims it “attracts bad LDL cholesterol”. However, the Japanese study referred to for weight loss found no difference in LDL cholesterol with either a low or higher amount of cider vinegar over a 12-week period. Others claim that cider vinegar works like a broom to clean toxic wastes out of the arteries. Sadly, there’s no evidence for that one either. Several studies have reported on the effects cider vinegar can have on blood glucose levels. One small study of healthy volunteers found that adding vinegar to a meal reduced glucose and insulin levels – at least for 45 minutes – and increased satiety for up to two hours. Another small study of people with type 2 diabetes reported adding vinegar to a high carbohydrate meal reduced the subsequent rise in the blood glucose level. However, this effect was only apparent for a high glycaemic index carbohydrate, such as mashed potatoes. When the carbs came from a lower GI food such as wholegrain bread, the vinegar had no effect. A word of warning for those with type 1 diabetes who also have damage to the vagus nerve (a common co-problem): when taking apple cider vinegar in water before a carb-rich meal, the delay in the stomach contents passing to the small intestine may alter the quantity of insulin so the usual daily injection may be inappropriate. As for allergies, acne, arthritis, hiccups and leg cramps, there is no evidence that apple cider vinegar prevents or cures any of these conditions. Nor is there evidence from any studies that cider vinegar has benefits for preventing or curing cancer. Unproven cancer cures can waste valuable time in seeking reliable treatments. So is it worth taking? Some sites promoting unrefined cider vinegar claim it is a good source of potassium. We certainly need potassium to help regulate the balance of water and acidity in the blood. But with apple cider manufacturers declaring their products have just 11 milligrams per 15 ml serve (and a recommendation for two serves a day) it is a negligible source. The recommended dietary intake of potassium is 2,800 mg/day for women and 3,800 mg/day for men. Bananas have around 400 mg. In Australia, products cannot claim to be a source of any nutrient unless a reasonable daily intake provides at least 10% of the recommended daily intake (RDI). A “good source” must have 25% of the RDI. There is also no evidence to support the idea that apple cider vinegar makes it easier to absorb calcium. On the good side, like all vinegars, it has virtually no kilojoules and, mixed with extra virgin olive oil, makes an excellent salad dressing. Finally, a word of warning: don’t drink apple cider vinegar “neat”. It can damage the throat and oesophagus. Even diluted, its acidity can damage tooth enamel. Rosemary Stanton is a Nutritionist & Visiting Fellow at UNSW.